Richard Parkes Bonington was born in the town of Arnold, four miles from Nottingham. 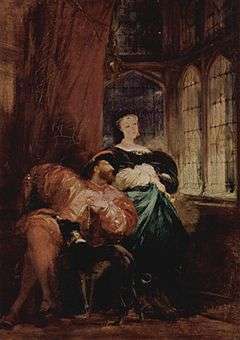 His father also known as Richard was successively a gaoler, a drawing master and lace-maker, and his mother a teacher. 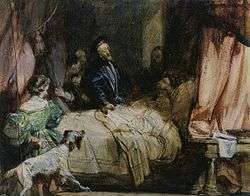 Bonington learned watercolour painting from his father and exhibited paintings at the Liverpool Academy at the age of eleven. In 1817, Bonington's family moved to Calais, France, where his father had set up a lace factory. At this time, Bonington started taking lessons from the painter François Louis Thomas Francia, who, having recently returned from England, where he had been deeply influenced by the work of Thomas Girtin, taught him the English watercolour technique. In 1818, the Bonington family moved to Paris to open a lace shop. There he met and became friends with Eugène Delacroix. He worked for a time producing copies of Dutch and Flemish landscapes in the Louvre. In 1820, he started attending the École des Beaux-Arts in Paris, where he studied under Antoine-Jean, Baron Gros. It was around this time that Bonington started going on sketching tours in the suburbs of Paris and the surrounding countryside. His first paintings were exhibited at the Paris Salon in 1822. He also began to work in oils and lithography, illustrating Baron Taylor's Voyages pittoresques dans l'ancienne France and his own architectural series Restes et Fragmens. 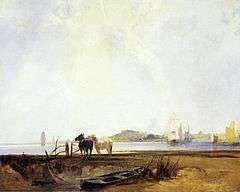 In 1824, he won a gold medal at the Paris Salon along with John Constable and Anthony Vandyke Copley Fielding, and spent most of the year painting coastal views in Dunkirk. In 1825 he met Delacroix on a visit with Alexandre-Marie Colin to London, and they sketched together there, and shared a studio for some months in Paris on their return; Delacroix influenced him in turning to historical painting. He also developed a technique mixing watercolour with gouache and gum, achieving an effect close to oil painting. In 1826 he visited northern Italy, staying in Venice for a month, and London again in 1827-8. In late 1828 his tuberculosis worsened and his parents sent him back to London for treatment. 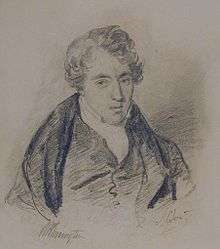 Bonington died of tuberculosis on 23 September 1828 at 29 Tottenham Street in London, aged 26. When I met him for the first time, I too was very young and was making studies in the Louvre: this was around 1816 or 1817... Already in this genre (watercolor), which was an English novelty at that time, he had an astonishing ability... To my mind, one can find in other modern artists qualities of strength and of precision in rendering that are superior to those in Bonington's pictures, but no one in this modern school, and perhaps even before, has possessed that lightness of touch which, especially in watercolours, makes his works a type of diamond which flatters and ravishes the eye, independently of any subject and any imitation. To Laurence Binyon however, "Bonington's extraordinary technical gift was also his enemy. There is none of the interest of struggle in his painting." Bonington had a number of close followers, such as Roqueplan and Isabey in France, and Thomas Shotter Boys, James Holland, William Callow and John Scarlett Davis in England. In addition, there were many copies and forgeries of his work made in the period immediately after his death. A statue to him was erected outside the Nottingham School of Art by Watson Fothergill, and a theatre and primary school in his home town of Arnold are named after him. In addition, the house in which he was born (79 High Street, Arnold) is now named ‘Bonington House’ and is Grade II listed. The Wallace Collection has an especially large group of 35 works, representing both his landscapes and history paintings. 1 2 "Arnold" in Chambers's Encyclopædia. London: George Newnes, 1961, Vol. 1, p. 633. ↑ Noon, Patrick: Richard Parkes Bonington "On the Pleasure of Painting", page 12. Yale University Press, 1991. ↑ Reynolds, Graham (1998) [1971 (as A Concise History of Watercolour))]. Watercolours. World of Art. London: Thames and Hudson. p. 108. ↑ "Arnold". Gedling Borough Council website. Gedling Borough Council. Retrieved 21 May 2014. ↑ Gedling Borough Council Planning and Environment Department Local Plans Section (6 December 2005). "Listed Buildings" (PDF). Gedling Borough Council. Retrieved 21 May 2014. Binyon, Laurence (1933). English Watercolours. London: A&C Black. Novotny, Fritz (1971). Painting and Sculpture in Europe, 1780-1880. Pelican History of Art (2nd ed.). Yale University Press. ISBN 0-14-056120-X. Wikimedia Commons has media related to Richard Parkes Bonington. Handprint.com – Biography by Bruce MacEvoy. Retrieved 17 November 2004.